On June 23, 2005, the US Supreme Court handed down one of the most reviled decisions in its history. By a vote of 5 to 4, the court ruled in Kelo v. City of New London that local governments may seize people's homes and businesses through eminent domain in order to make the land available to new owners for redevelopment. In so doing, the majority decided that the words "public use" in the Fifth Amendment -- "nor shall private property be taken for public use without just compensation" -- did not mean what they said. Property could be confiscated for entirely private use, the court ruled, so long as the government expected some eventual public benefit, such as an expanded tax base or new jobs. "Promoting economic development is a traditional and long-accepted function of government," wrote Justice John Paul Stevens, in a rather bloodless majority opinion joined by Justices David Souter, Ruth Bader Ginsburg, Stephen Breyer, and Anthony Kennedy. "[T]here is no basis for exempting economic development from our traditionally broad understanding of public purpose." But as Justice Sandra Day O'Connor pointed out in a vigorous dissent, the Supreme Court had never held that economic development alone could justify the use of eminent domain. After all, she observed, practically any lawful use of private property will generate some incidental public benefit. If it takes no more than that to satisfy the Constitution's command that only land required "for public use" may be condemned, "then the words 'for public use' do not realistically exclude any takings, and thus do not exert any constraint on the eminent domain power." 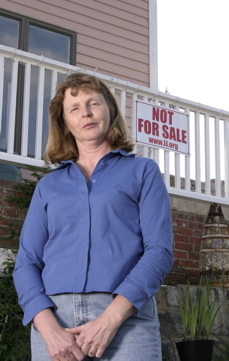 O'Connor's dissent, in which Chief Justice William Rehnquist and Justices Antonin Scalia and Clarence Thomas joined, put the bottom line starkly: Kelo meant that property owners could be stripped of their land whenever the government decided that some other owner -- some wealthier owner -- could use it to make more money or generate more business. "The specter of condemnation hangs over all property," warned the dissenters in a passage that was widely quoted and struck a chord with the public. "Nothing is to prevent the State from replacing any Motel 6 with a Ritz-Carlton, any home with a shopping mall, or any farm with a factory." Even before Kelo, the use of eminent domain had expanded beyond the classic case in which private property is taken to make way for a highway or post office or other public facility. In the 1954 case of Berman v. Parker, the Supreme Court had unanimously permitted eminent domain to be deployed for what was then called "urban renewal." It upheld property takings within a blighted area of Washington, DC, where two-thirds of the housing was beyond repair; the property was then sold to new owners for redevelopment. The Public Use Clause encompassed "public purpose," Berman held -- and eliminating the harm caused by blight was a legitimate public purpose. Property owners could be forced to yield to a government seeking to clean up a dirty, dangerous, impoverished slum. But Fort Trumbull -- the New London, Conn., neighborhood at the heart of the litigation in Kelo -- was no slum. To be sure, it was no Greenwich, either, as I discovered in 2001, when I visited New London to learn more about the eminent-domain litigation that was just then getting underway. Home to an ill-smelling sewage plant, separated from the rest of New London by railroad tracks, Fort Trumbull was nobody's idea of chic. The Revolutionary-era fort that gave the neighborhood its name was neglected and overrun with weeds. On the other hand, many of Fort Trumbull's families were conscientious about their properties, into which many had invested much sweat equity -- stripping and refinishing hardwood floors, putting in flowerbeds, installing new plumbing, replacing broken sidewalks. Matt Dery, a lifelong resident of Fort Trumbull, described to me how he had bought the house next to his parents' home, gutted it to the studs, and renovated it by hand, working on it every day for a year before getting married and moving into it with his bride. Susette Kelo bought a 110-year-old Victorian cottage overlooking the Thames River and researched 19th century building styles to find a historically-appropriate paint color; she settled on Odessa Rose, a shade of pink. Mike Cristofaro showed me the yews and fruit trees his parents had planted in their back yard on Goshen Street; they had transplanted them from their first house in New London -- a house the city had seized through eminent domain 30 years earlier. In short, Fort Trumbull was like countless other working-class American neighborhoods -- homey but humble, cherished by its residents though not likely to inspire covetous glances from outsiders. But everything changed when Pfizer, the giant pharmaceutical corporation, decided in 1998 to build its new research headquarters along the river just south of Fort Trumbull. City officials were thrilled to have landed a Fortune 100 company; at one point the mayor called it "the greatest thing that's ever happened to New London." To pave the way for Pfizer's arrival, the city charged the New London Development Corporation (NLDC) with clearing out the adjoining neighborhood and replacing its modest homes and shops with something more posh: offices, a conference center, upscale condominiums, a luxury hotel. No public use was envisioned for the new construction. Nearly all of it was to be privately owned and operated. The NLDC's goal was to make Pfizer happy, and Pfizer executive George Milne put his company's wish list in writing. "Our New London expansion requires the world-class redevelopment planned for the adjacent 90 acres in ... Fort Trumbull," he wrote in 1999, itemizing the amenities Pfizer was looking for: "a waterfront hotel with about 200 rooms, a conference center and physical-fitness area, extended-stay residential units, and 80 units of housing." Accommodating the families already living in Fort Trumbull, however, was not a part of the Pfizer/NLDC vision. As another Pfizer executive condescendingly told the Hartford Courant: "Pfizer wants a nice place to operate. We don't want to be surrounded by tenements." Ruthlessly, the NLDC began to obliterate the old neighborhood. Property owners were pressed to sell their homes. If they refused, they were told, the city would condemn their property and acquire it by eminent domain. Most of the homeowners, many of them elderly, bowed to the pressure and left. A handful of holdouts, including Kelo, the Derys, and the Cristofaros, refused, and fought city hall all the way to the Supreme Court. 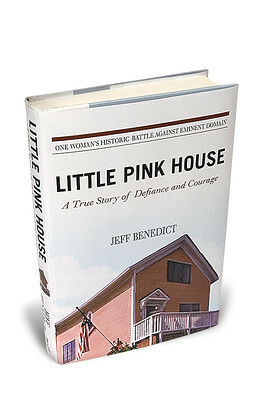 Little Pink House is the story of that fight, and it is told with verve and passion by journalist Jeff Benedict. Though not a neutral narrative -- Benedict doesn't hide his admiration for Kelo and the other property owners who battled to save their homes -- it is fair and deeply informed. To recreate the small-town political street fight that led to a notorious Supreme Court landmark, the author conducted hundreds of interviews over three years with nearly everyone who played a role in the case. He also reviewed a vast paper trail, from transcripts and government memos to private journals, letters, and e-mails. The result is a brisk and absorbing case study in how easily government and the politically well-connected can muscle past the rights of ordinary citizens. It is also a heartening reminder of how seriously Americans regard their liberties, and the grit with which they are capable of defending them. At the heart of Little Pink House are two compelling women. One is Kelo, a fortysomething EMT-turned-nurse who had grown up in poverty and whose sole asset was the fixer-upper on the water she had fallen in love with at first sight. It was the only property she had ever owned and it meant the world to her. "I have never been happier in my life than I am now," she wrote on her first night in the house in 1997, "sitting on the porch rocker watching the water go by." The other central figure is Claire Gaudiani, the flamboyant and hard-driving president of Connecticut College, who agreed to lead the NLDC and made it her aim to carry out the most sweeping redevelopment in New London's history. A highly accomplished Renaissance woman, Gaudiani tended to be imperious and relentless when pursuing a goal. She insisted that redeveloping Fort Trumbull would be a boon to New London's poor -- she compared her mission at the NLDC to those of Jesus and Martin Luther King -- yet she seemed oblivious to the price Fort Trumbull's homeowners were being asked to pay. "Anything that's working in our great nation," she blithely declared, "is working because somebody left skin on the sidewalk." -- a carpenter, an auto mechanic, a nurse, a self-employed businessman, and some senior citizens hoping to spend their final days in the homes they had occupied for decades. Most of them had dirt under their nails at the end of the workday. What they didn't have was the pull to prevent New London from dispossessing them for the sake of a powerful company and higher tax revenues. Such disparities are nearly always present when the eminent-domain power is abused -- a point that wasn't lost on the Kelo dissenters. "Any property may now be taken for the benefit of another private party, but the fallout from this decision will not be random," Justice O'Connor wrote. The beneficiaries are likely to be those citizens with disproportionate influence and power in the political process, including large corporations and development firms. As for the victims, the government now has license to transfer property from those with fewer resources to those with more. More than 200 years before Kelo, Supreme Court Justice William Paterson characterized eminent domain as "the despotic power . . . of taking private property when state necessity requires." To seize private property absent such "state necessity" is worse than despotic, it is unconscionable. Unfortunately it is not uncommon; what happened in New London has happened innumerable times in recent years. In 2003, the Institute for Justice -- the libertarian public-interest law firm that represented the Kelo plaintiffs pro bono -- documented hundreds of examples of eminent domain being used to seize property for the benefit of politically favored businesses. The New London case was unusual only because it went to the Supreme Court. As of 2008, two state supreme courts have rejected the notion that the government can take private property to generate tax revenues or create jobs, and three others have cast doubt on its validity. . . . [S]even states have passed constitutional amendments to ban taking private property for economic development and 42 of the 50 states have passed legislation to protect property owners from abusive eminent domain practices. Susette Kelo's little pink house still stands: It was moved last year to a new location in downtown New London, where it has been designated a historic landmark and has become the home of a local preservationist. The revival of Fort Trumbull, meanwhile, has yet to begin. Nearly four years after the Supreme Court allowed New London to confiscate homes and shops in the name of economic development, nothing has been built where the old neighborhood used to stand.